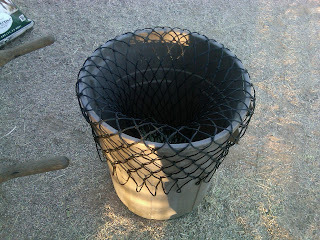 I love my small mesh hay nets. 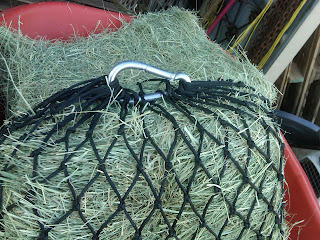 I use them for "portion control" for Choli - my IR mare - when she's kept up in her dry lot. I also use them for everyone on windy days - I hang some from fences and also place some around their turnout area as "pillows". 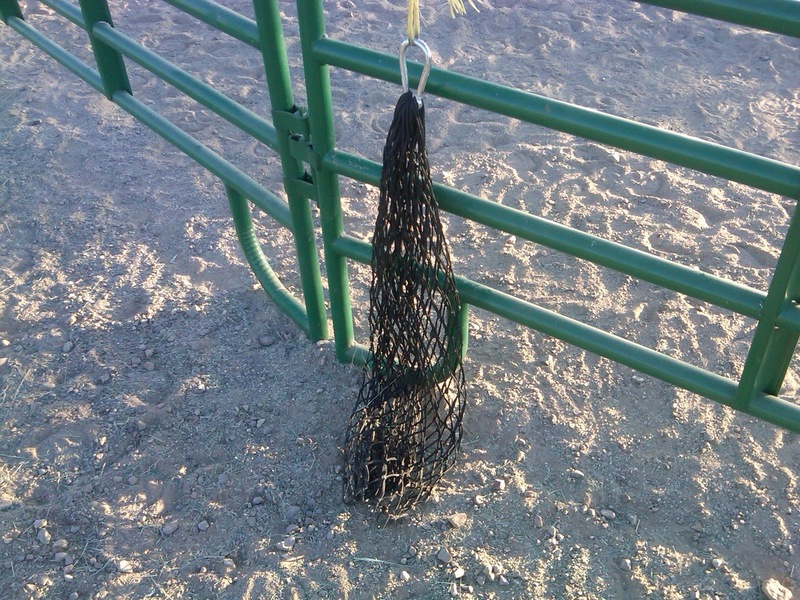 Using a spring clip instead of the cord that comes with the net to close the top, there isn't anything large enough to get a hoof in. I've found that if I put out a flake of hay and put a filled net pillow nearby, my horses will go for the pillow first - seems they enjoy a puzzle. These are the small mesh hay nets from Chick's Discount Saddlery. They're larger than the ones I got previously from Smith's. They fit nicely in a 30 gallon trash barrel for filling. You can see I took the cord out of the top as I use clips instead. 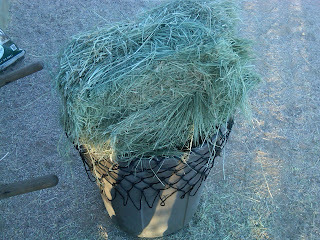 This is about ten pounds of Bermuda hay - a good "double" flake or two smaller flakes. They can stretch to hold more. 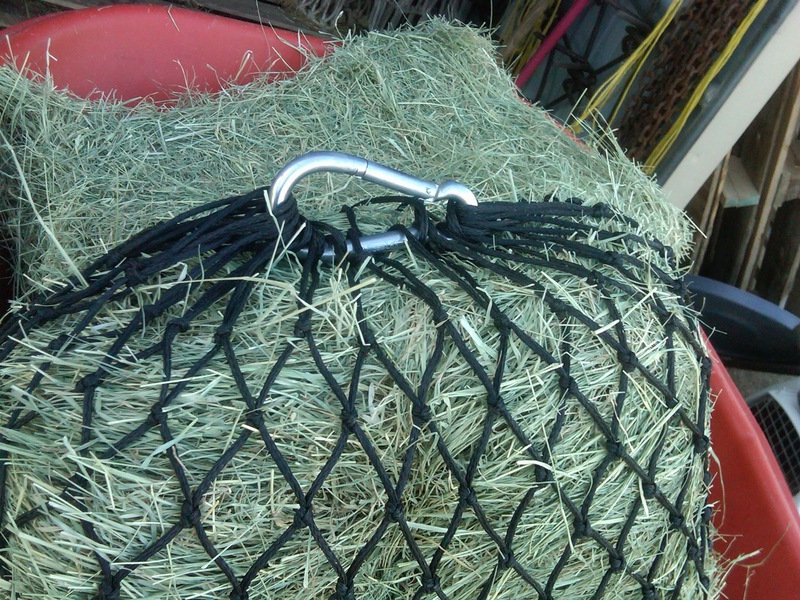 I usually set it up on the wheelbarrow for a convenient height to put the clip on. 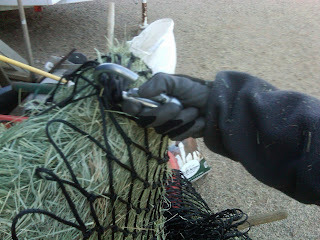 I weave the clip - a 3" snap hook - through the top loops. 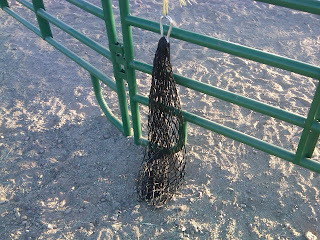 I have not had any problems with my horses getting caught in these. The 3" hook works well, any smaller is difficult to hold all the loops. 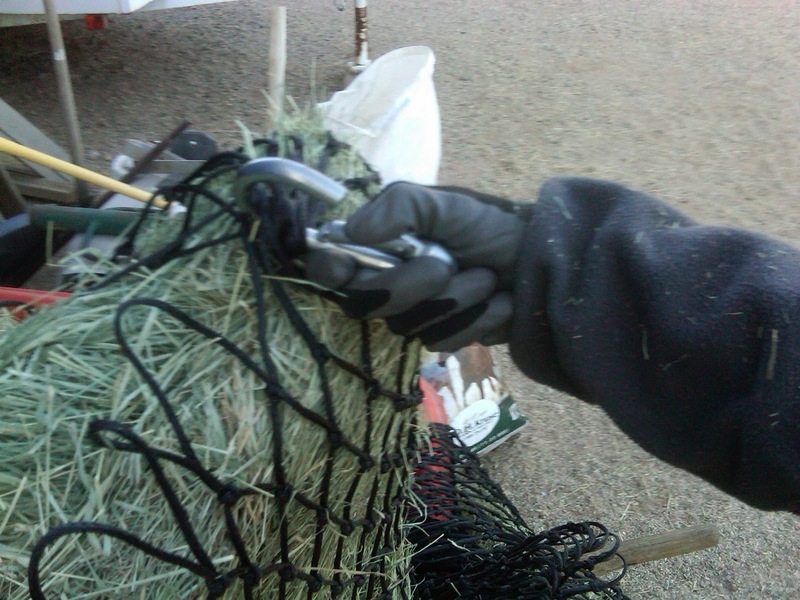 I clip the full hay bag to a loop of baling twine. I tried using fancier methods but found this works best. 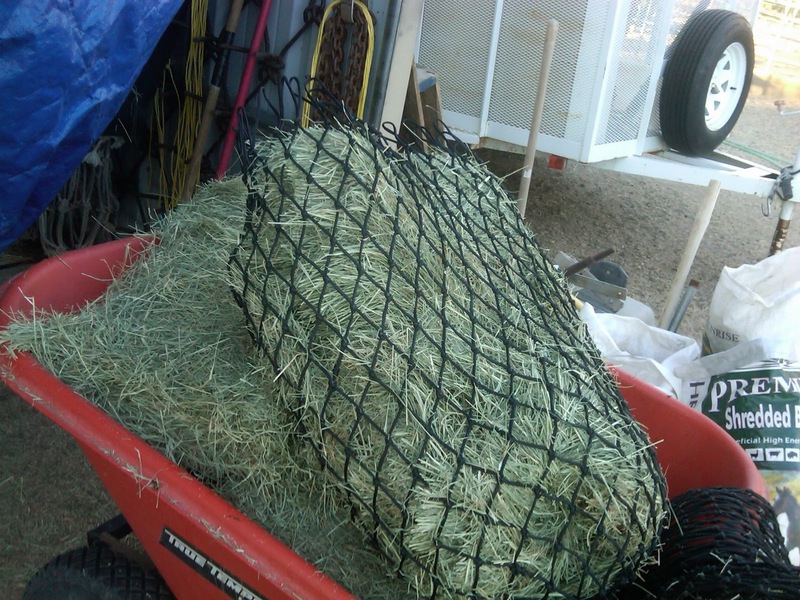 If I were feeding alfalfa, would definitely use mats under the nets as horses will pick up everything while picking up the leaves. I currently have ten of these for four horses. I try to keep them stuffed ahead of time and, when they're all turned out together, use at least six filled nets. When it's not windy out, I often put out a "trail" of hay - not more than a bite or two every five feet or so. 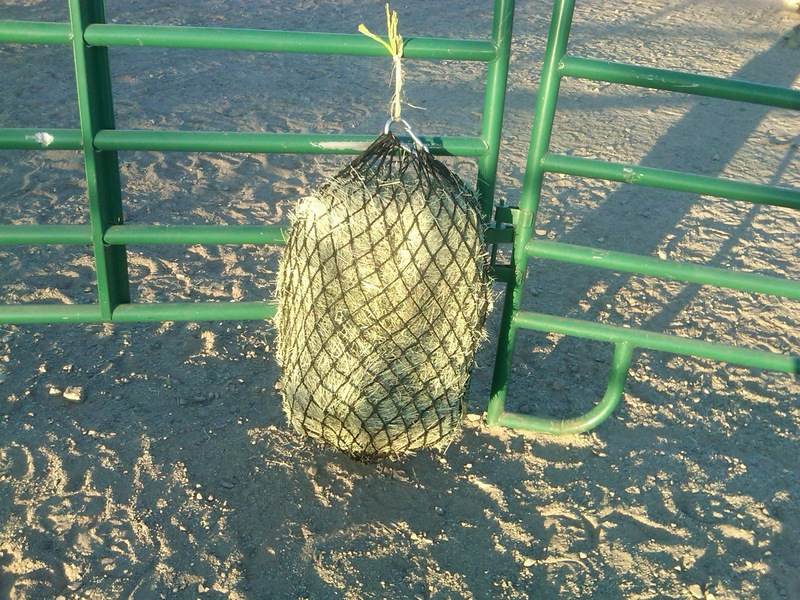 I prefer using several smaller hay nets vs a larger slow feeder. 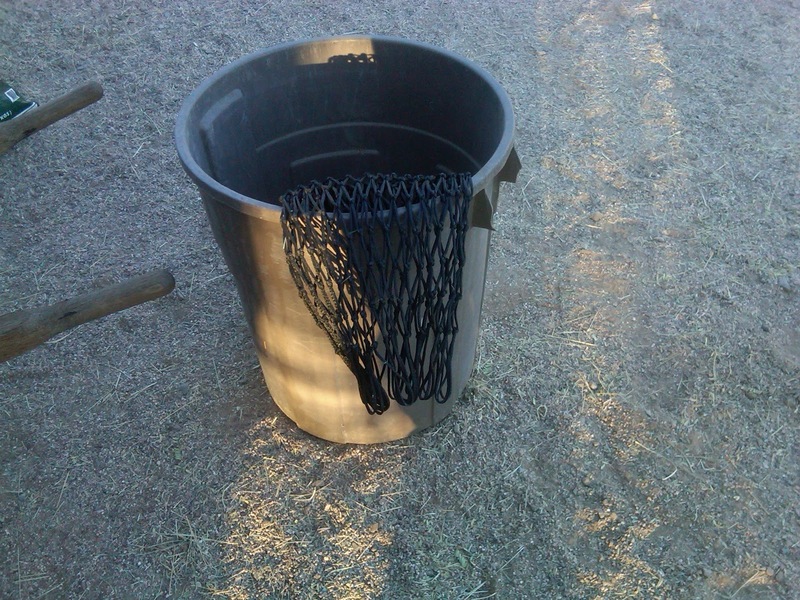 When I used a larger feeder, my horses tended to stand in one place and eat and poop. With several smaller nets, they rarely spend more than five to ten minutes eating in one spot before moving on. 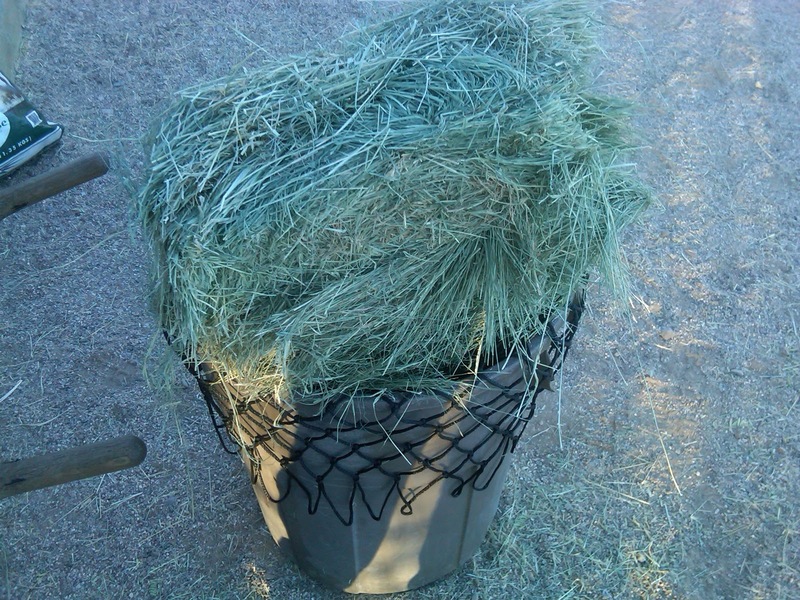 To Psyllium or Not - Hay is the Answer!